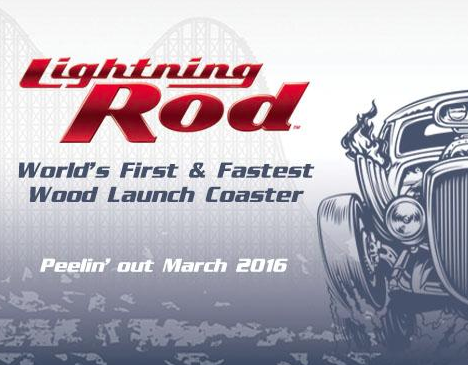 NewsPlusNotes: Lightning Rod to Strike at Dollywood in 2016! 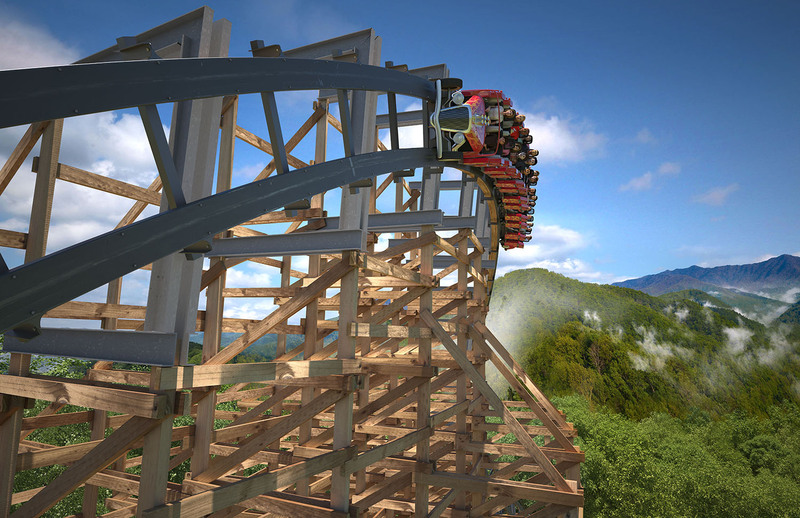 In an announcement of epic proportions, Dollywood revealed their 2016 launched wooden coaster to the world today, to be known as Lightning Rod. 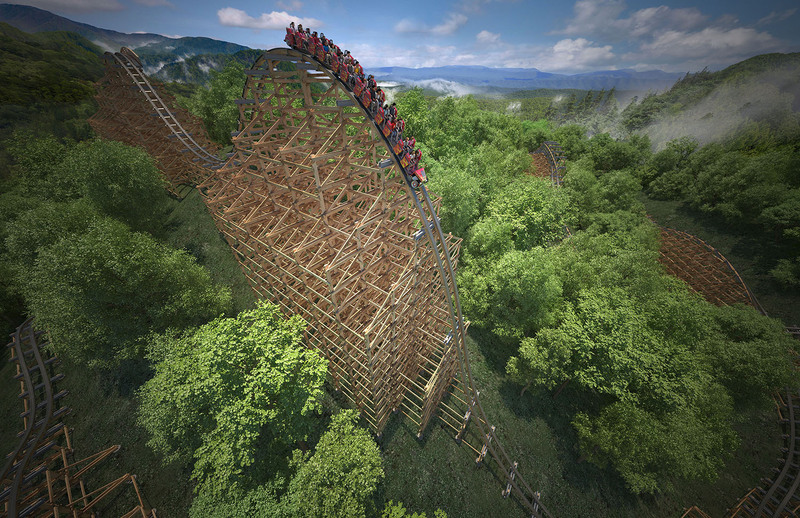 The coaster will be the world's first and fastest wood launch coaster when it opens in March of 2016, and will also be the park's largest single investment at a cool $22 million. The ride will be built by Rocky Mountain Construction. The attraction will start in the park's Jukebox Junction area, which pairs nicely with its cars themed as "tricked out 1950s-era hot rods." Soon after departing the station the trains will be launched upward more than 20 stories at 45 miles per hour - quite a way to start the ride! The launch will leave trains at the top of the hill seen on the far left of this image, and after a small drop they will be faced with a 165 foot, 73 degree plunge down the side of the hill and into the trees. 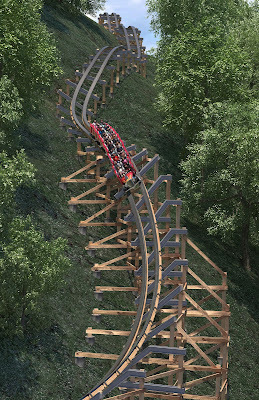 At the bottom the trains will hit 73 miles per hour, giving the ride the fastest wooden coaster title. 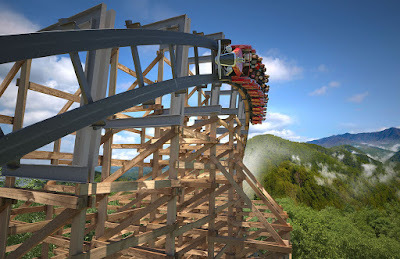 The ride will then navigate the landscape on the top of the hill, zooming through elements like a giant 90 degree banked wave turn, a 90 degree outward banked top hat and a "twist and shout" element. 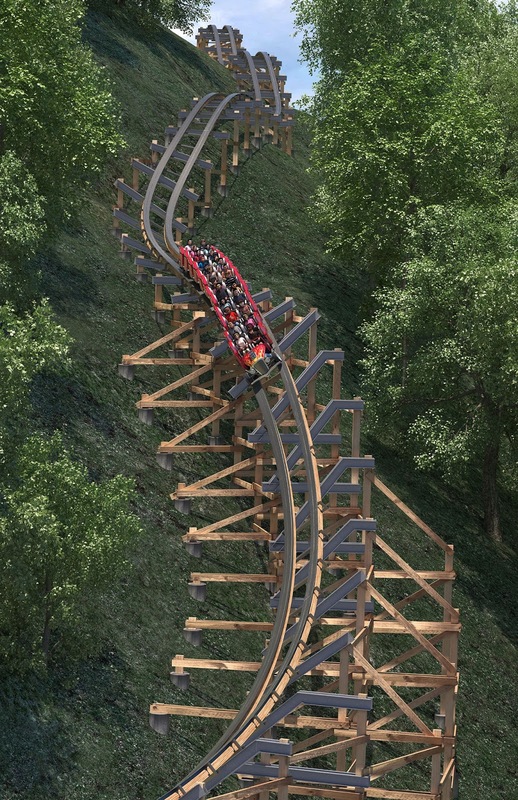 As with many other Rocky Mountain Construction rides, the track will feature many extreme moments of banking - and in total about 20 seconds of air-time. And element that looks absolutely wild will get the trains back down off the top of the hill, and that's the quadruple down seen here. Trains will head down this hill through several moments of air, twisting as they hop downward as well. We've never seen an element quite like this before, and needless to say this has coaster fans everywhere drooling quite a bit. The end of the ride will see a couple more small hills and then a highly banked upward turn that Dollywood is calling a "non-inverted half loop" leading into the final brakes. Detailing more of the coaster's theme, the park says that "Lightning Rod puts riders in the driver’s seat of Johnny Rev’s newest hot rod. After months of tinkering, Johnny invites Dollywood guests to step behind the wheel for the first test drive of his flashy new creation. Like any proper hot rod, massive header pipes and an imposing injector scoop peer out from the train’s flamed bodywork." The themed trains will feature 12 cars, each seating two riders for a total of 24 passengers. This is the full announcement teaser that was released today along with the ride's announcement. In total, the ride's track stretches 3,800 feet and there will be 12 separate moments of air-time given to riders over the 3 minute, 12 second ride. Watch this post for more information coming soon from Scott & Carol, who were at the park for today's reveal!